Lazy, Hazy, Crazy . . . I went back to the ophthalmologist today for my follow-up appointment after my eye surgery a couple of weeks ago, and the news was generally good. He didn't see any more tears in my retina, and the one he repaired looks fine. He gave me the all-clear to resume my normal activities, with the exception of using a jackhammer or a tiller. I have to hold off on that for a couple more weeks. I think I'll be able to manage that. (I actually have used both a jackhammer and a tiller in my life, but not lately.) The eyestrain that I've been having occasional problems with is just that, eyestrain, and nothing to do with my retinal problem. I'll have to find ways to combat that on my own. Given the shape of my eyeballs and the fact that I've already had one retinal tear, statistically I'm at greater risk than normal for future problems, so I'll have to continue to be aware of that, but it's possible I'll never have any more trouble with it. That's what I'm hoping. I've never read a Rick Brant novel but I am a big Lester Dent fan, and the following is from Will Murray's superb article, "The Secret Kenneth Robesons," which is the definitive Dent bio thus far. It appeared some 25 or more years ago in Murray's DUENDE fanzine. By 1948, Dent's pulp markets, including Doc Savage, were starting to dry up. Murray writes, "Dent reverted to juvenile writing with a series of boy's books he wrote for Grosset & Dunlap under the name John Blaine between 1947 to 1958. The Rick Brant series has never before been linked with Dent but he is clearly the author. He seems to have written all of the novels from #1 to #15, whereupon a Hal Goodwin reportedly took over the series." I read this in Will's article, too, although I had forgotten where I'd seen the Lester Dent/Rick Brant connection mentioned. For years I believed it to be true. I wanted it to be true, because I was a big Doc Savage fan and as I noted previously also a big fan of the Rick Brant series. In fact, the second book in the series, THE LOST CITY, was probably my favorite book when I was around twelve years old. The writing in this one really sounds like Dent's work. And yet, Rick Brant fandom (this site, for example) seems to be convinced that Hal Goodwin wrote all the books and Lester Dent had nothing to do with them. The evidence they have, including interviews with Goodwin, seems pretty convincing. And yet . . . and yet . . . I know there are cases where the actual authorship of a book is buried so deeply that it's almost impossible to determine. I've written books where literally only three or four people in the world know about my involvement. I'm sure other writers could say the same thing. So do I hold out hope that maybe Lester Dent really did have something to do with those Rick Brant books? Or is that just wishful thinking on my part, being a Dent fan? I don't know, but if anybody has any concrete evidence either way, I'd be happy to see it. In the meantime, if I can put my hands on a copy of THE LOST CITY, maybe I'll reread it. It's been a while since the last time I did. UPDATE: I've been in touch with Will Murray, and he now believes that Dent didn't write any of the Rick Brant books after all. But I think that Hal Goodwin must have read some of the Doc Savage novels. The similarities between the two series are striking, and the Doc Savage pulp magazine was still being published when Goodwin started the Rick Brant series. Even the titles of many of the Rick Brant books sound like Doc Savage titles. I'm not implying anything improper on Goodwin's part at all, just floating the theory that he could have been influenced by Dent's work, and there's nothing wrong with that. I've mentioned before that I usually really enjoy the first day on a new book, and today was no different. The work went very well. I never got around to writing an outline for this book, but I have the story pretty much worked out in my head, so I'm hoping I won't write myself into any corners. To change things up a bit, I monkeyed around with the font and character size on this document and made it look a little different. That doesn't really have anything to do with anything, of course, but I like to vary my routine. Whenever I have to go somewhere, I'll often come back by a different route if it's convenient. Just one of my little oddities. I've got a million of 'em, as somebody (Jimmy Durante?) used to say. Before I picked up this book I didn't know much about David Sedaris. I'd seen him on TV a few times when he was on David Letterman's show, and I knew he was supposed to be a humorist, but in his TV appearances I found him sort of odd and not very funny. When I started reading this book of essays by him, I reacted pretty much the same way. They were dark to the point of being a little creepy at times and not very funny. However, the more I read and the more I got into the rhythm of Sedaris's prose, the funnier they got. I wound up enjoying this book quite a bit. I have to wonder how much of it is true and how much is embellished for the sake of humor, but that's really not the point, I suppose. More important that it's well-written and had me laughing out loud at times. 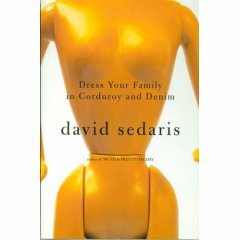 I'll probably look for more of Sedaris's books. I did some investigating on the Internet and found this page, which will tell you all you need to know about Rip Foster. Here's the short version: This is the only Rip Foster book, and the character was created for this novel, not adapted from some other medium. I don't know why the series never continued. In 1958 this book was reprinted as RIP FOSTER: ASSIGNMENT IN SPACE, and I believe there was another reprint during the Sixties. Most importantly, though, I discovered that the author, "Blake Savage", was really Hal Goodwin, who wrote the Rick Brant series as John Blaine from the late Forties to the mid-Sixties. When I was a kid, I loved the Rick Brant books, and when I reread some of them a few years ago, they held up just fine and were still pretty darned good books. So I may have to go ahead and read this one pretty soon. British heroic fantasy author David Gemmell has passed away. I was sorry to hear about this. 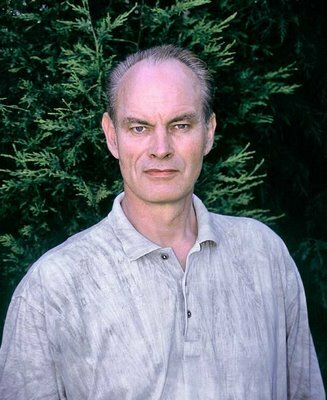 Gemmell was one of my favorite writers and a nice guy to boot. I had a good conversation with him at a World Fantasy Convention a few years ago. He was a Western fan and you could tell that by reading his fantasy novels, which often had strong Western influences. If you haven't read his work, start with his debut novel LEGEND. It's a great book. A Detective Book Club triple volume (one of the old brown ones) including ALIAS BASIL WILLING by Helen McCloy, ACCIDENT BY DESIGN by E.C.R. Lorac, and THE WATCH SINISTER by Maria Blizard. I picked up this one for the McCloy novel. I read one of her Basil Willing books years ago and remember enjoying it. I'm not familiar with the other authors. SEE YOU AT THE MORGUE by Lawrence G. Blochman, a 1941 hardback. DEATH TAKES A BOW by Frances and Richard Lockridge, a large print edition of a 1943 Mr. and Mrs. North novel. I was a big fan of the Lockridges at one time, especially their books about Pam and Jerry North. I haven't read one in years, though. SLEEP NO MORE by Sam S. Taylor, a 1949 hardback from Dutton featuring private eye Neal Cotten. I read a few books in this series a long time ago and remember liking them quite a bit. 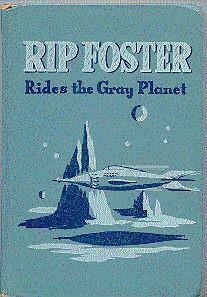 RIP FOSTER RIDES THE GRAY PLANET by Blake Savage, a 1952 Whitman juvenile SF novel. I'd be willing to bet that Blake Savage is a pseudonym, but I have no idea who really wrote this one. I also don't know who Rip Foster was. A comic strip character, maybe? I'll have to investigate this one. Most of the books published by Whitman were media tie-in novels, but not all of them. So, not a great haul, but I'm glad I checked out the sale anyway. Well, the idea of taking it a little easier this week and resting my eye worked just fine until I realized I was within shouting distance of finishing the book I've been working on. Naturally, I had to push hard and get it wrapped up, especially the past couple of days. My eye was fairly sore on Monday, Tuesday, and Wednesday, probably because I fouled up on Sunday evening and toted a car battery around, completely forgetting until it was too late that I wasn't supposed to lift anything heavy. I realize a car battery doesn't weigh a ton or anything, but it's still not light. But the eye feels better today and writing quite a bit doesn't seem to have hurt it. I still have a "floater" in my left eye, which makes it look like a black cobweb is dancing and weaving around in front of my eye, when the problem is actually inside. The floater will probably be there for a couple of months, maybe longer. I don't notice it much except when I'm working on the computer or reading . . . which is most of the time, of course. Anyway, I finished the book this afternoon and plan to take tomorrow off except for maybe writing an outline, then start the next book Saturday. I have a couple of books I'm reading at the moment, alternating between them: DRESS YOUR FAMILY IN CORDUROY AND DENIM, a collection of humorous essays by David Sedaris, and the Adventure House replica of the October 1937 issue of SPICY MYSTERY STORIES. Yes, I know that's an odd combination. Anybody who's been reading this blog for very long probably isn't surprised by it, though. On Monday, before all the trouble with my eye, we were out running errands and stopped by Half Price Books. 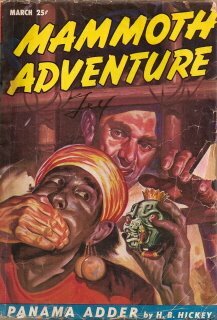 For the first time ever, I found a pulp there: the March 1947 issue of MAMMOTH ADVENTURE. Now, I'm not that big a fan of the Ziff-Davis pulps, and I'd never heard of most of the authors in this issue, but you know I wasn't just about to leave it there. 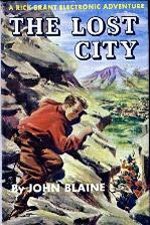 There are only four stories, two novellas and two novelettes: "Valley of the Big Smoke", a Northern by Frances M. Deegan; "No Holds Barred", a wrestling yarn by Alexander Blade (a Z-D house name; I don't know who really wrote this one); "Cavern's End" by C.A. Baldwin, a sea-going adventure despite the title; and "Panama Adder", a Central American jungle tale by H.B. Hickey. I haven't read any of them yet, but I'll bet at least some of them are pretty entertaining. Well, this has been an interesting week. Tuesday morning I got up, started checking my email, and suddenly saw flashes of light and what looked like a tarantula hovering just off my left eye. I even swatted at the sucker. Of course, there was nothing there. What happened was that the retina on the back of my left eye had just torn. Luckily, the tear was small and the retina didn't detach from the eye, which would have meant a trip to the hospital. As it was, after a day in the ophthalmologist's office, I was able to have laser surgery on the eye to repair the tear. Although I wouldn't want to go through that every day, it wasn't too bad. The vision in my left eye isn't back to normal yet and may not be for a couple of months, but I can still read and work on the computer. My eyes do get tired faster than they used to, which means taking more frequent breaks, but I can live with that. When I was writing I usually took a break every six or seven pages; now I take one after three or four pages. And I may not spend quite as much time on-line for a while. But as of now I think I'll be able to proceed fairly normally. Physically I'm not supposed to lift anything heavy for a couple of weeks, but that's about all that's off limits. The one I really feel sorry for is Livia, who'll have to listen to my griping about my eye. A good patient I ain't. I'm sure a lot of people will be weighing in on Mickey Spillane's passing. I really enjoyed most of Spillane's novels, and some of them I've read several times, which is rare for me. I'll probably never forget reading ONE LONELY NIGHT on a summer evening at my sister's house, or THE SNAKE during study hall when I was in high school, or KISS ME, DEADLY at my aunt's house in Blanket, Texas, when we were visiting down there. The first Spillane novel I read was THE DEEP, when I was in sixth grade. I persuaded several of my friends to read it, too. I don't know if they remember that, but I sure do. This is a sad day. I may have to dig out my copy of ONE LONELY NIGHT and read the first chapter again. Evan Hunter has been one of my favorite authors since I was in fifth grade and read one of those Winston science fiction novels called DANGER, DINOSAURS! by Richard Marsten. Of course, at the time I had no idea that Richard Marsten was really Evan Hunter and Ed McBain and Hunt Collins and Curt Cannon. But over the years I read and greatly enjoyed his books under all those names, too. This book is a collection of early stories, written between 1952 and 1957, most of them originally published in the great crime fiction digest MANHUNT. In his introduction, Hunter reveals that John McCloud, the editor of MANHUNT, was really Scott Meredith, the literary agent for whom Hunter worked at the time. I didn't know that. The introduction is very good, as are the notes that Hunter includes for most of the stories. The stories themselves, as you might expect, are nearly all excellent. The only real misfire in my opinion is the private eye parody "Kiss Me, Dudley". Hunter is open about not being comfortable writing private eye stories, and with the exception of his Matt Cordell stories (later reprinted by Gold Medal as Curt Cannon stories), it shows. "Kiss Me, Dudley" is, obviously, a parody of Mickey Spillane's Mike Hammer novels, but it seems to me that Hunter didn't really understand Spillane's work at all and just grossly exaggerated the surface characteristics of the Hammer novels to produce this story. It's not funny. The longest story in the book is also a private eye yarn, "Death Flight", originally published in ARGOSY. It's about a PI investigating a plane crash caused by sabotage, and while it's okay, you can tell that Hunter's heart wasn't really in it. The rest of this collection is really good, though, especially the stories about cops. Hunter mentions several times that he was a fan of DRAGNET, and it shows in the police procedural stories. Even though the cop-narrators and their partners have different names in every story, they all might as well be Joe Friday and Frank Smith. There are even some of the ironic little taglines of the sort used so effectively by Jack Webb to conclude scenes. Hunter is also known for his stories about juvenile delinquents, and the ones included here are all good. Overall, this is one of the best books I've read so far this year. I'd never heard of John Fante until a year or so ago when I read something about the movie version of his novel ASK THE DUST. It sounded pretty good, so I plan to watch the movie when it comes out on DVD later this month. In the meantime I ran across this collection of his short stories at the library and decided to give it a try. I don't normally comment on a book until I've finished it, but I'm afraid I'm giving up on this one about halfway through. The stories are highly autobiographical, with several fictional alter egos standing in for Fante, and I won't deny that they're well-written, for the most part, in a nice terse style. But nothing happens in them. They're just plotless little vignettes about the life of a would-be writer. Maybe I would have liked them better if I'd read them when I was in college. I think I had a higher tolerance for that sort of thing back then. I wanted to like Fante's work, but based on this collection, anyway, I don't care for it. 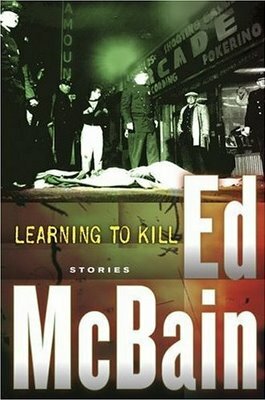 But speaking of short story collections, I picked up LEARNING TO KILL by Ed McBain, a collection of 25 crime stories written by Evan Hunter and published mostly in MANHUNT from 1952 to '57, under several different names. Now this one, as you might expect, is really, really good. I'll be alternating between it and David Morrell's BLACK EVENING (which I'm also enjoying) for the next few days. 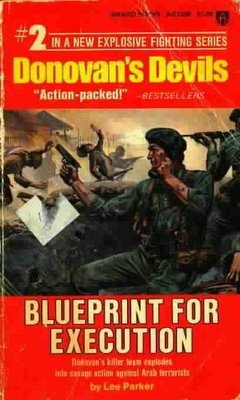 This evening on Vince Keenan's fine blog is a review of one of the books from the Seventies men's adventure series The Liquidator, written by "R.L. Brent". I knew that Brent was really a pseudonym for an author named Larry Powell, but in looking around the Internet for more information on Powell, I discovered he'd written a series I'd never heard of: DONOVAN'S DEVILS. This series published by Award Books under the name Lee Parker ran for three books in 1974 and '75. I found a scan of the cover of the second book, which you can see here. Considering my book-buying and reading habits in the mid-Seventies, how in the world did I miss this one? Now I have to fight the urge to go out and look for these books, even though if I found them and bought them I'd probably never read them. It's a sickness, that's what it is. I've been hit with a bad case of the summer doldrums the past three days, seizing every excuse I can find not to work, so as a result I haven't gotten very much done. I haven't been completely useless during this time, however. I've been reading page proofs for the Civil War novel Livia and I have coming out this fall from Cumberland House, WAR DRUMS, and today I wrote 8 pages on the house-name Western novel currently in the works. I'm sure more productive days will kick back in sooner or later. I just hope it's not September before they do. I'm also reading a couple of short story collections, THE BIG HUNGER by John Fante and BLACK EVENING by David Morrell. More on them, probably, when I finish them. All in all, an excellent volume. Highly recommended. Today is the second anniversary of this blog. According to Blogger, this is also my 600th post. (I'll take their word for it; no way I'm going back to count all of them.) It was just luck that it worked out that way, I didn't plan it. I hope those of you who read the blog get a chuckle out of it every now and then, or hear about a book you'd like to read or a movie you'd like to see. I went back to read that first post and discovered that I had just completed book #165 the day before. I didn't remember that. The one I finished about a week ago was #191, so that's 26 books in two years. I'll take that any time. Also on the day I started the blog, our dwarf goat Sugarfoot passed away. Since then we've lost another goat, Miss Kitty, but ol' Festus is still around. You can certainly tell what we used as inspiration in coming up with names for them. We also had goats named Gabby and Lullaby, after two of the best Western movie sidekicks, and Belle Starr, who unfortunately had health problems from the start and didn't live long. I don't know how many books I've read or movies I've watched in the past two years. A lot, though. If you get the idea that all I do is sit around and write and read books and watch movies . . . well, that's pretty much right.